Editor’s note: This is the third in a series of seven articles by A.T. Kearney on the trends that are radically transforming the health care sector. The promise of consumer-driven health care is not new. Over the last 15 years, we have heard a great deal about the shift away from the traditional doctor-centric treatment model toward an open, consumer-driven orientation for diagnosis and provision of services. In this new model, patients use the increased availability of medical information to understand their health better, choose providers more selectively, and play an increasingly active role in determining the treatment. They ask that their health care experiences come to mirror their other mainstream consumer ­experiences. The introduction of high-deductible health insurance plans in 2003 was one of the early agents of this change, pushing patients to consider costs, as well as other factors, when they made their health care decisions. Indeed, research has documented evidence of these trends. A 2017 Pew Research Center study indicated that 68% of Americans surveyed reported that they conduct their own research when deciding on treatment for a serious health problem in addition to consulting a doctor. And a recent study published in Health Affairs found that a large majority of those surveyed believe that comparing costs for health care is important. This attention to cost is particularly apparent in Americans’ concern regarding prescription drug prices: 27% of patients surveyed in 2016 reported asking their doctor or pharmacist about cheaper alternatives to prescriptions. Consumer-driven health care, however, has not yet truly taken hold, and it is only in the last five years that we have seen signs that this shift is imminent. The most significant harbinger of this change is the explosion of technological devices for health care and the growing interest in this arena from traditional consumer companies, including Google and Apple. The digitalization of the health sector — the increased use of electronic health records, as well as other developments that allow patients and providers to access health data and services online — has made it easier for patients to sort through their personal health information, understand it, and share access to it. Similarly, the proliferation of wearable electronic devices and mobile phones gives patients greater information about their health, allowing them to monitor vital signs and other relevant health indicators around the clock. According to Salesforce survey data, 27% of Americans report owning a wearable health device. And Rock Health finds that 46% of consumers are now “active digital health adopters,” defined as using three or more digital health tools. These technological developments, coupled with the shift in general consumer interest in health and wellness, are accelerating patient empowerment and changing the provider paradigm. It is important to note that not all segments of society will adopt this new model, and that different cohorts will use it in different ways. Healthy Millennials who are tech savvy, for example, certainly will be early adopters, using fitness tracking devices and researching tools to manage chronic illnesses. Families on high-deductible plans will also be early adopters, seeking greater convenience, more control over their health care, and a better ability to manage costs. Older generations may use these new technologies to allow them to maintain their health in their homes and avoid more-costly care. Devices to manage drug regimens and to notify children or caregivers when they need help, for example, may be especially useful to this population. Finally, the 10 million to 20 million Americans who lack health insurance may also be early adopters of certain services as they consider how best to use scarce resources. This shift, then, offers pharmacies and other health companies a unique opportunity to transform business models to accommodate patients’ more active role and to meet their expectations for more cost-effective yet individualized treatments. Patients are not comparing their pharmacy visits today to the health care delivery they experienced 10 years ago; rather, they are comparing these interactions to their other current consumer experiences. While these mounting consumer expectations have not yet been met at modern pharmacies, leading companies are recognizing these shifts and acting to take advantage. 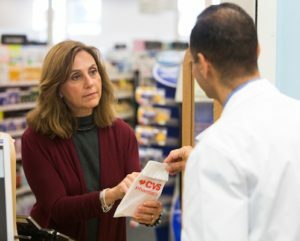 Ambitions include greater transparency in prescription drug pricing, new processes to eliminate lines and enhance efficiency, and new systems that provide patients with timely and appropriate reminders, allow for easy clinic scheduling, and enable consumers to text questions to the pharmacy and receive prompt text ­responses. Chris Paddison and Jerry Cacciotti are partners for the Americas in the health practice of A.T. Kearney, a leading global management consulting firm. They can be reached at chris.paddison@atkearney.com and jerry.cacciotti@atkearney.com, respectively.